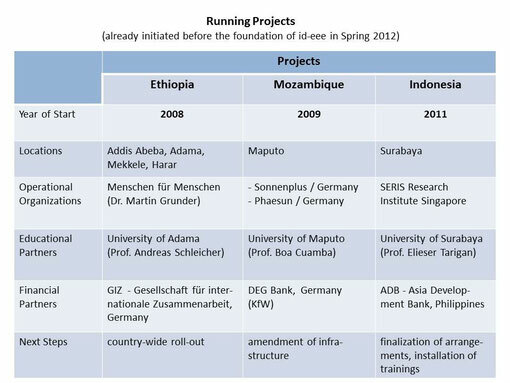 The projects described below were already started by Prof. Peter Adelmann before the foundation of the institute. The underlying philosophy and the performance of the projects led to the support of the United Nation's Division for Sustainable Development. In favor of the applied concept, this department began to design a corresponding program with the objective to involve further countries in Africa, Asia and Latin America. 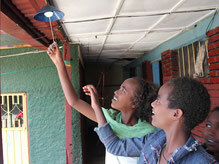 In February 2012, the UN published its appeal addressing all relevant stakeholders to support the "Min-Electricity Access Program" and to join activities under the new project umbrella. They appointed Prof. Peter Adelmann as Lead Consultant oft he UN for the "Min-E Access Program. This initiative and . Such a project umbrella will especially be needed to coordinate the UN's cross-border initiative and to exchange experiences in a fast and effective manner. Relevant stakeholders are invited to join activities.